For a long time my voice was not my own. I had one, then lost it as I allowed myself to put more value in others than that of myself...my gut. 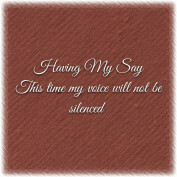 Years later, after countless tears have fallen and millions of lies been revealed, I am discovering my voice...having my say, and this time, I will not be silenced.